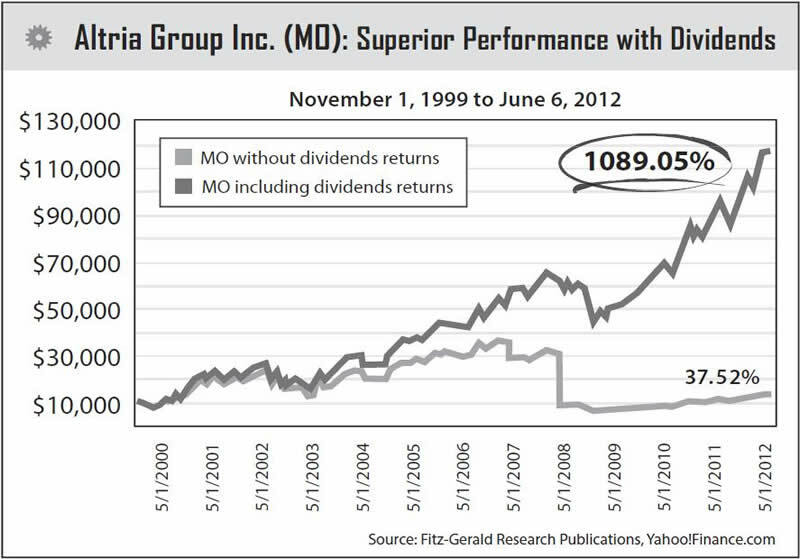 Keith Fitz-Gerald writes: Many people are surprised to learn that dividend income and reinvestment can account for nearly 90% of total stock market returns over time. That's right. Not a quarter... Not half... But 90%. That's why placing a high priority on dividends in the [Money Map's proprietary] 50-40-10 Strategy is paramount to its success. Unfortunately, this goes counter to the inclinations of far too many investors. They spend the bulk of their time chasing "the next hot stock" or searching for the next "sure thing." No doubt we all love the elation that goes with being up 25%, 50%, 100%, or more. Don't get me wrong, though. I'll take gains like that too - and we get more than our fair share in The Money Map Report model portfolio. Yet when it comes to consistently growing and protecting our money, I'd rather focus on getting the cold, hard cash that dividends kick off. That's because I know those are a much bigger component of overall investment returns over time. I point this out because what most people fail to realize is that successful investing is a matter of continuous performance - NOT instantaneous performance. In some cases, the dividends are so steady and increase so much that over time you can actually make more in dividends than you originally paid to buy the stocks that produced them. Two of the founding fathers of modern investing made that abundantly clear in the 1930s. Benjamin Graham and David Dodd pointed out in their seminal work, Security Analysis (1934), that dividends were the primary contributing factors to long-term total return. dividendsA few years later, John Burr Williams noted in his book, The Theory of Investment Value (1938), that "a stock is worth the present value of all the dividends ever to be paid upon it, no more, no less." If you don't believe those assertions, ask anyone who invested in Altria Group Inc. (NYSE: MO) back in 1999 if they'd disagree. They've enjoyed total returns north of 1,000%. Folks who've held Kinder Morgan Energy Partners LP (NYSE: KMP) or Reynolds American Inc. (NYSE: RAI) over the same time frame have seen total returns of 1,578% and 3,311%, respectively - with returns from dividends far exceeding capital gains in both cases. Not bad for having held through an extraordinarily difficult decade that a lot of investors wrote off as "uninvestable." There will be plenty of trying times ahead just like the past 12 years - and once again, it will be dividends that maximize your returns. Granted, building wealth through dividends takes time - but time is the one guaranteed asset you have to work with. Instead of constantly trying to cheat it, learn to work with it. Chances are excellent that your money will thank you.